Bride Jessica didn’t need a makeup artist at her wedding; she took it into her own hands, getting ready for her wedding to Jay. Before walking down the aisle, the bride and groom posed for some portraits overlooking the Empire State Building. The couple planned what is called a Witkin ceremony with officiant Susan Turchin. Family and friends then danced the night away and Jessica’s little nephew was the star of the show, besides the bride, of course! Congratulations are in order to both Ira and Christina who tied the knot earlier this summer. To honor both of their religious traditions and cultures, Flowers by Daye set up a beautiful chuppah at the church and the happy couple were married underneath the beautiful stained glass church windows by the Parish priest. Photographers Sarah and Chris started the day at the Marriott East Side, meeting up with both the bride and groom before they said “I Do” and walked down the aisle. What also made their special day truly unique was the lighting at 583 Park, where the couple celebrated their wedding with family and friends. The ballroom pillars were washed with white light and later in the night hues of blue highlighted the windows and the walls. The couple’s wedding DJ, DJ Taiga, kept the party moving on the dance floor. Christina’s custom wedding shoes, with a splash of teal on the bottom, was a nice way to incorporate the “something blue” into her wedding day. Congratulations Christina and Ira! Bride Aliza wanted to celebrate her wedding day in an environment that means the most to her- her family home. And Groom Josh was on board, of course! Aliza’s dress was traditional with a twist, featuring tiered tulle layers and lace cap sleeves. The couple’s first look by the trees and rocks was almost like a fairytale. Aliza was surrounded by her nieces and nephews throughout the day who, along with Josh’s four brothers, were all a big part of making the day special. The groom, surrounded by his family and friends, marched to greet his beautiful bride before she was escorted down the aisle by her father, Mayer. Guests partook in the Horah and partied the night away at the outdoor tented reception. Aliza’s “something blue” was her blue Converse sneakers she wore later on in the night. Mazel Tov, Aliza and Josh! 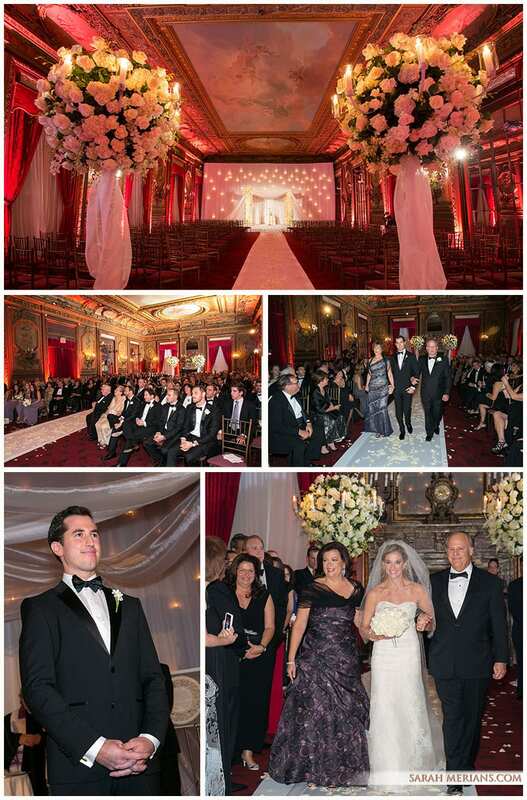 Sarah and Edward tied the knot at the The Ritz Carlton- Battery Park Hotel earlier this summer. It was so nice to see all the young children involved in the wedding as flower girls and ring bearers! Red was the color theme from the bride’s bouquet to the sashes on the girls’ dresses to the boutonnieres. The Ritz Battery Park has the best views of the Hudson River and Battery Park City! Take a look at some of the great shots of our bride & groom and the sunset below. WEDDING WEDNESDAY: We take you back to the summer with bride Lindsay and her then-fiancé Joe tied the knot at Glen Island Harbour Club in New Rochelle earlier this year. Bride Lindsay looked stunning in her strapless beaded and tiered wedding gown. Arcadia Florist designed the bride’s beautiful bouquet of white roses and Lindsay added a unique touch: a photo charm necklace remembering her grandfather. Right Mix provided the dance floor entertainment for the evening, while our photographer, Tina, enjoyed being a part of this important day with Lindsay and Joe, capturing all their special moments. Enjoy a snapshot of their wedding day in photos below. For this week’s Wedding Wednesday, we wanted to share one of our fall weddings with all of our Facebook fans. Jackie& Randy tied the knot this October and Sarah Merians Photography & Video Company was there to celebrate the moment. Our photographers Tina and Jenny met up with the bride-to-be at her Mandarin Oriental hotel room as she got ready for the big day while Randy and his guys were at the Metropolitan Club with our photographer, John, anticipating Jackie’s arrival. What a great view of Central Park from both locations! When the limo pulled up, it was magic. The love between these two can be felt through their eyes. Matthew from Atlas Floral Decorators created a chuppah adorned with white florals on all four poles. Event planner Amy Winters of Amy Winters Events put together a very special evening from dinner to dancing with Marianne Bennett and the Element Music NYC crew! Congratulations to Jackie, Randy and their families. 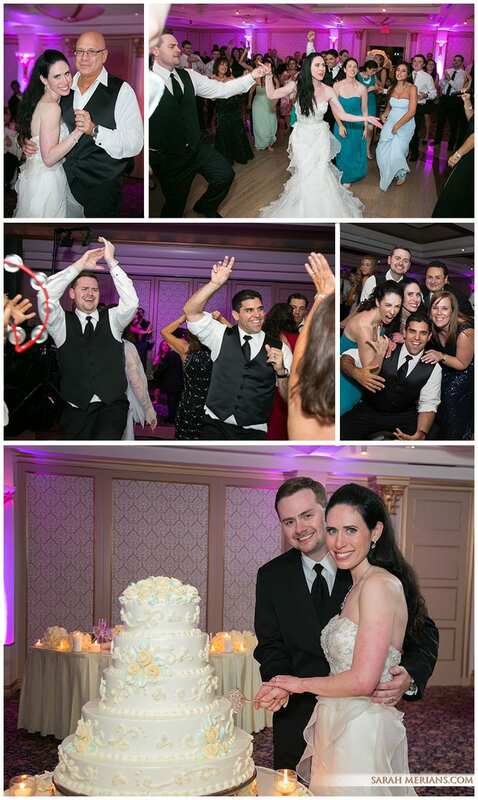 WEDDING WEDNESDAY: Christina and Nick tied the knot in a beautiful spring wedding ceremony at the Gansevoort Park hotel in midtown. Ariston Flowers designed the beautiful orchid bouquets that Christina and her bridesmaids carried down the aisle. Groom Nick showcased his love of action heroes in from his custom cuff links to the groom’s towering superhero cake! And how delicious is Christina’s adorable flower girl?!? Congratulations to Christina and Nick on their nuptials! We wish them the best in their life together. The views of the Hudson River couldn’t compare to how groom, Adam, looked at his bride, Ali, at their Lighthouse wedding. Simply put: there was so much love in the room. Ali chose to spice up her classically-designed strapless wedding gown with teal blue pumps and a bouquet of white and black anemones, designed by Atlas Floral Decorators. The room decor, a sea of white and green florals also designed by Atlas, captured the moment perfectly. Scratch DJ kept the crowd moving on the dance floor and the night wouldn’t have been complete without three tiers of vanilla and chocolate wedding cupcakes. Congratulations, Ali and Adam! We wish you all the best. These two are made for each other! Being blessed with the best weather of the winter, Robyn and Jason’s wedding weekend started off right…and ended with smiles and so many beautiful memories. The couple posed for some beautiful sunset shots before signing their ketubah and walking down the aisle, where they officially became husband and wife. Take a look at their wedding day story, in photos and on video, below. Congratulations, Robyn and Jason! Bride Stephanie and Groom Craig are a perfect match. When they saw each other for the first time on their wedding day, their faces lit up. Craig even took out his guitar and serenaded his bride from the Pier Sixty balcony! It was such an honor for Sarah to be a part of capturing the memories for these two as they entered their lifelong journey together as husband and wife. Congrats, Stephanie and Craig!